The Institute of Cultural Affairs and the Uptown Coastal Initiative are organizing an environmental education series, Out and About Uptown’s Coast, starting on May 21st. Urban Ecology is the topic of the first event of the nine-session series, focusing on native ecology including wildlife habitat in Uptown’s coastal zone. The Urban Ecology session will start at 1pm at the Institute of Cultural Affairs, 4750 N. Sheridan Road, for a classroom style experience with local ecology experts, including Susan Ask of animalia project. The second component of the session will be a guided nature walk through Montrose Point Bird Sanctuary and Montrose Beach Dunes. The session is free, and participants can RSVP for the session at tinyurl.com/UptownICZ. 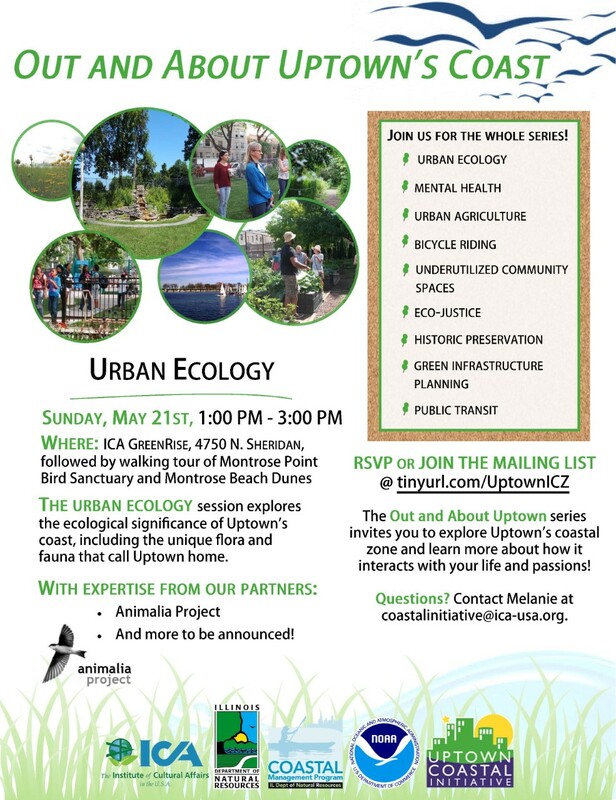 The Out and About Uptown’s Coast series hopes to connect residents, workers, and visitors, and strengthen links between the well-being of the coastal ecosystem and the health and well-being of those who live, work, and visit Uptown’s coast. Highlighting local expertise and creating a space for diverse attendees to learn about and explore the area together, each session’s unique lens will target different subjects and circle back to universal accessibility to and stewardship of Uptown’s coast across a spectrum of disciplines. Read more about the series on ICA’s website. This was a really fun and informative event. The leads really know their stuff about the history of Uptown and the changes to the Montrose area coast through the years. This is the first of ten events so there are nine more. I highly recommend going to some of them. They are free and you get a nice long walk in.